You don’t have to look in your wallet to know that no paper U.S. currency features the face of an American woman, but one lawmaker wants that to change sometime soon: Rep. Luis Gutierrez urged Congress today to vote on a bill he introduced last month that would change the face of money as we know it, literally, by putting a woman on the $20 bill. Last week, an online campaign called Women on 20s spearheading the effort to get a woman on the $20 bill announced that voters had chosen Underground Railroad conductor Harriet Tubman as the preferred candidate, though Rep. Gutierrez noted during a speech today on the House floor that his bill wouldn’t designate which female should have that honor, just get the Treasury to move forward with plans to replace President Andrew Jackson as the face of the $20 bill. “She used the tools of democracy to improve America. She fought for the little guy against the strong guy. And she was willing to put herself at great risk to ensure the justice for others. And she was a woman and she was black,” he said in pushing Congress to vote on the bill. 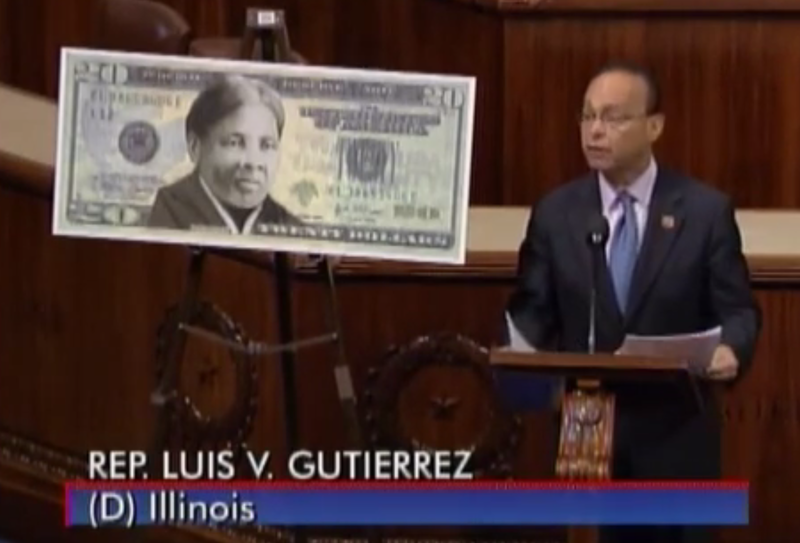 “In a few years, maybe in a few months, when the idea of putting a woman on our money is considered a quaint, old-fashioned debate, and similarly when the idea of putting a person of color on our money no longer seems like such a remarkable step, we will wonder why it took so long,” Rep. Gutierrez added.